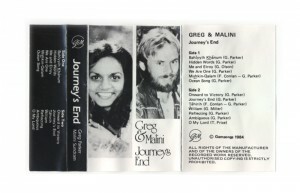 Over the course of 1983, Greg Parker and Malini Sundram recorded the songs that became the album Journey’s End. With the enthusiastic support of Malini’s mother, Shantha Sundram who attended Baha’i conferences all over the world, the cassettes quickly sold. Greg was bemused to receive a letter from a friend living in the tiny Pacific nation of Kiribati, who informed him that a bootleg copy of the cassette had made its way to him! Most of the songs are my own compositions as I express my own spritual experiences. The songs are about being a Baha’i rather than what the Baha’i Faith is about. have been captured from an old cassette complete with tape hiss and flutter. The noise was digitally removed and with some boosting, compressing and a bit of reverb and delay here and there we have the new remastered digital edition of Journey’s End. If you have got this far, you are quite likely going to download the songs. Just one small request. Send us an email to let us know who you are, where you live and what you think. You can even find Journey’s End on Facebook. A post on our wall would be so great!